Why Is Modern Plumbing So Important? Arvada Plumbing Services is Arvada’s trusted source for plumbing care. We offer an unrivaled level of customized plumbing services—in partnership with Levi Shelby Plumbing Services. Levi Shelby Plumbing Services is the core company around which Levi Shelby, a locally famous master plumber here in Arvada (and also a proud former Marine), is now looking to start weaving a network of people just like himself. He is a craftsman of the old school whose only goal is the attainment of ever greater and yet greater perfection for the customer. He is, in other words, an uncompromising professional who is driven by exactly the same sort of fierce client focus that has always driven us. It’s the kind of focus that always considers the budgetary constraints of our customers and includes a FREE cost estimate. We extend our personalized service to residential and commercial customers throughout the Arvada area, where we are well known for the outstanding quality of plumbing care that we provide. The plumbers at Arvada Plumbing Emergency Service are available 24 hours a day, seven days a week. We understand that plumbing emergencies can happen at any time of the day or night, and we strive to be at your home or site within 60 minutes of receipt of your call for assistance. It is our mission at Arvada Plumbing Services to reduce your stress level by resolving all of your plumbing issues as quickly and affordably as possible. The plumbers at Arvada Plumbing Services will arrive at your home or office equipped with the specialized tools required to safely provide the best treatment. 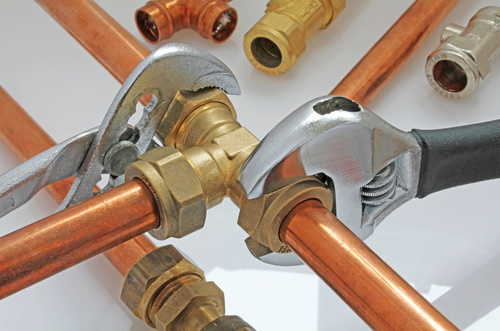 We possess the permits and certifications required to complete virtually any plumbing task. When there are multiple solutions available to treat a problem, we will discuss the various options and costs with you so that you can consider your budget and make an informed decision. Finally, we will provide you with valuable tips to help you keep your sinks, tubs, pipes and toilets running smoothly. Call to schedule a visit or to learn more about the comprehensive array of plumbing services that Arvada Plumbing Services offers. We welcome the opportunity to resolve any plumbing issue you may have, and also any heating issues you may have (we are not just a plumbing company but also a full-service Arvada plumbing and heating company). We look forward to showing you our premier quality of service! When the plumbing technician we dispatch to you arrives at your office, workplace or home, be sure to ask him for a free copy of the “Plumbing Arvada Guidebook” (known for short as "Plumbers Arvada CO”). ​It’s a handy little booklet, published by the Association for Better Arvada Plumbing Services, which covers all things plumbing in Arvada. It contains a listing and review of all Arvada plumbing companies (or at least of all the Arvada plumbing companies that were in business in 2011 when the booklet was published), as well as a listing and review (in the section entitled “Plumbing Emergency Service”) of the best plumbers you will find in this city. In addition it contains a listing and review of plumbers near Arvada, mostly in Wheat Ridge and Westminster. And it carries a full report on plumbing supply in the greater metropolitan area of Denver, as well as on plumbing services in Denver, plumbing companies in Denver, and on plumbing repair in Denver. The plumbing services denver Guidebook is a very enlightening report if what you’re looking for is honest plumbing in Arvada, and if you want to know the state of the art of plumbing services in this city. We think you will find it well worth a read. But we have only a limited number of copies left, so don’t forget to ask before supplies run out!